This tapestry "Flowers Of Grace" shows a gorgeous arrangement of flowers in full bloom by Riccardo Bianchi. Full of beautiful and cohesive use of color and form, this tapestry bears the signature hallmarks of the works of Bianchi. Here we see roses and a variety of colored tulips in full bloom arranged in a vase on a ledge. The masterful use of color here complements the subject of flowers perfectly and is reminiscent of the works of the Dutch master flower painters. Thrilling in his mastery of portrayal of flowers and nature, Bianchi sets himself apart in his ability to evoke beauty in his subject matter. 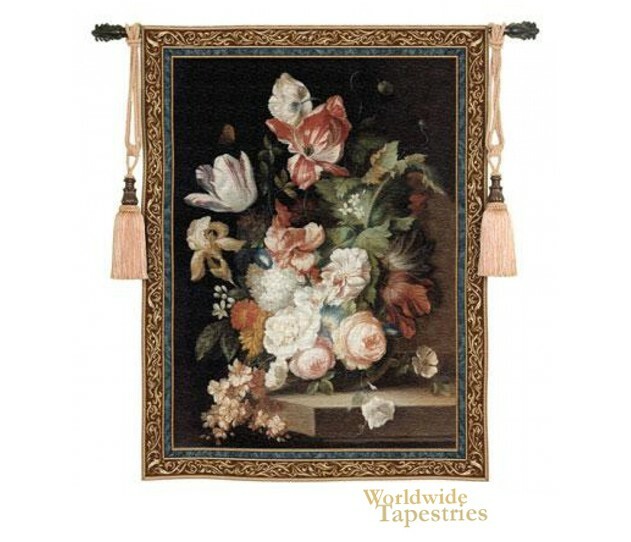 This floral tapestry "Flowers Of Grace" is backed with a lining and has a tunnel for easy hanging. Note: tapestry rod and tassels, where pictured, are purchased separately.